Uromastyx | Zoo Med Laboratories, Inc.
Uromastyx is a genus of lizard found in parts of Africa and the Middle East. There are several species regularly offered in pet stores, and care requirements for common species are very similar. 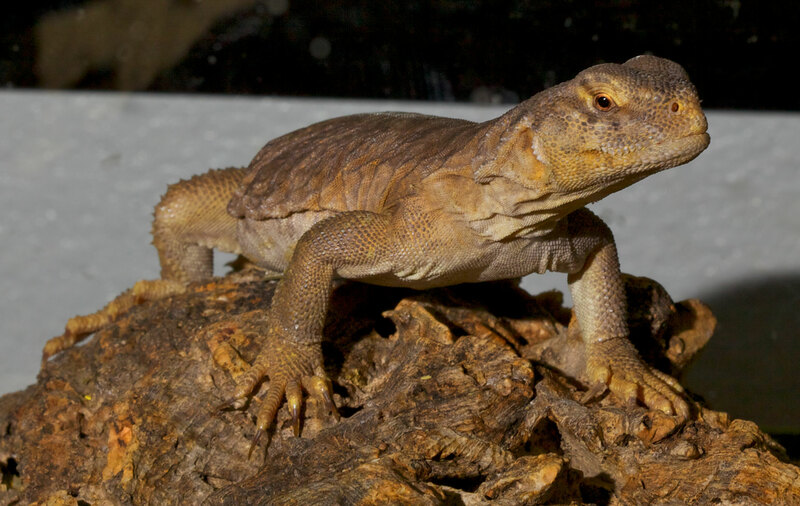 Uromastyx lizards come from very hot places and need high temperatures to do well as pets. In the wild these lizards live in burrows and will do best if offered underground retreats. This lizard is best suited for intermediate to experienced keepers and is not recommended for beginners. Juvenile Uromastyx need a minimum 20 gallon terrarium. Juveniles can be housed together in a 30 gallon terrarium. Adult Uromastyx need a minimum 40+ gallon terrarium. Provide plenty of hiding and basking places. Rocks, thick branches or Mopani Wood make excellent choices for decorating your lizard’s habitat. Daytime Terrarium Temperature: 85-90° F.
A nighttime drop in temperature is natural and can be accomplished by turning off all overhead heating devices, and leaving a ReptiTherm® UTH on 24 hours per day. Zoo Med’s Basking Spot Lamp, PowerSun®, Repti Halogen™ and Ceramic Heat Emitters, are good choices for heating Uromastyx enclosures. Provide a large rock directly under the basking area to help retain heat. UVB Lighting is essential for Uromastyx to process calcium in captivity. Without UVB lighting and a proper diet, Uromastyx will develop serious health problems such as Metabolic Bone Disease (MBD). Zoo Med’s ReptiSun® Linear and Compact Fluorescent Lamps are a great choice for providing Uromastyx with UVB. The PowerSun® is an excellent way to provide both UVB and Heat all in one lamp! Uromastyx live in arid, sandy places in the wild and will do well on a variety of sand-type substrates in captivity. They prefer a mixture of sand and soil that will allow them to burrow. Hatchling Uromastyx will do best on Cage Carpet such as Zoo Med’s Eco Carpet or Vita-Sand®. Excavator® Burrowing Clay Substrate will allow you to create a naturalistic terrarium complete with burrows and tunnels for your animals. Uromastyx live in burrows and will require underground retreats to provide security. A mixture of Eco Earth® & ReptiSand® or ReptiFresh® are excellent choices of substrates for Uromastyx species. Uromastyx are mostly herbivorous with the occasional insect as a treat. Although they will eat many different types of food, plant matter like leafy greens and vegetables should make up the bulk of their diet. Hatchlings and juveniles can occasionally have a cricket or a mealworm; this should be kept to once or twice a week and only one or two at a feeding. Collard or Dandelion greens, Mustard greens, Hibiscus flowers, Rose flowers, bokchoy, Romaine lettuce, green leaf or red leaf lettuces and veggies like squash, pumpkin, zucchini, sweet potatoes and carrots should be offered 2-3 times per week. Zoo Med recommends feeding our Natural Grassland Tortoise pellets or the Gourmet Tortoise pellets supplemented with a mixture of greens and vegetables to create a complete and balanced diet. Repticalcium without Vitamin D and Reptivite with D3 should be added to both live and plant food as directed.